You've gotta love the Eat Mor Chikin Cows of Chick-fil-A. There's even more reason to love and appreciate the cow crew on July 11th when Chick-fil-A customers nationwide celebrate annual Cow Appreciation Day. This is every cow's time to shine as we dress up in moo-velous cow attire to score free eats at participating Chick-fil-A restaurants. Word to the wise, this is serious- seriously fun! Be prepared to see cuteness, creativity, comedy all in the same place. Here are 3 things you have to do on Cow Appreciation Day at Chick-fil-A. Join the best of the best as Chick-fil-A and customers across the country visit restaurants on July 11 from opening until 7:00 pm to celebrate the Eat Mor Chikin Cows. How do we celebrate Cow Appreciation Day? Anyone wearing cow-themed apparel will receive a free entrée, while kids dressed in cow-like anything fun will receive a free kid’s meal. Check out CowAppreciationDay.com for fun costume ideas! 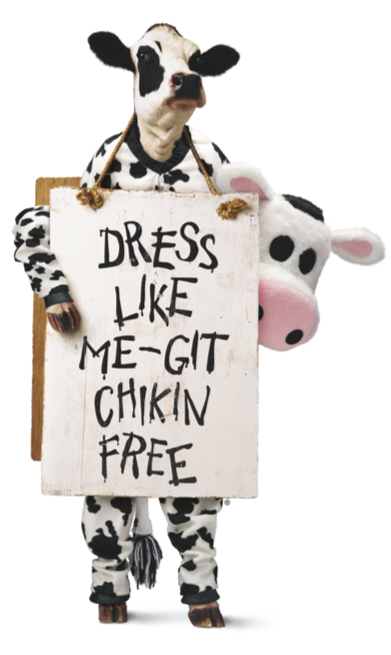 1- Make or buy your cow costume (or any sort of cow apparel, really). 2- Wear your cow costume to your favorite Chick-fil-A between Opening and 7 p.m.
3- Receive a free entree!